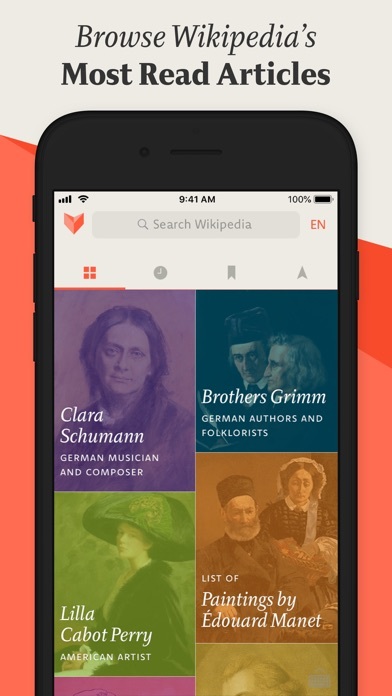 Wikipedia, better than ever—on iPhone, iPad, and Apple Watch. 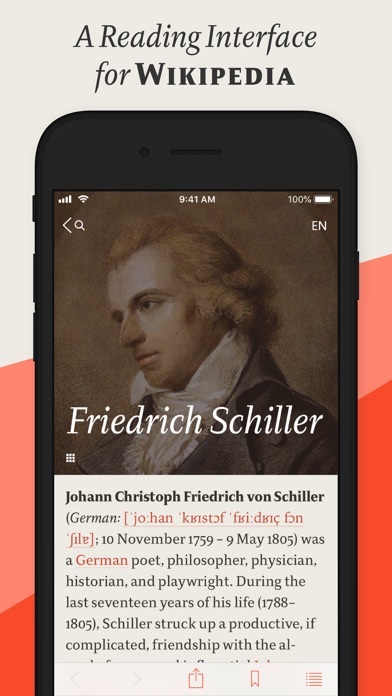 Discover the world and enjoy beautiful typography with this sleek app. 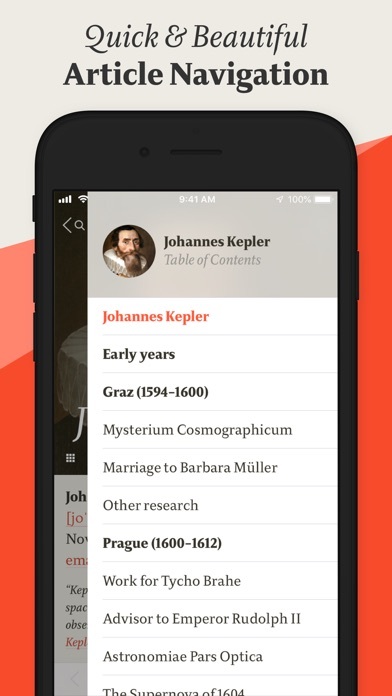 “If you love learning new things on Wikipedia but want a gorgeous interface to interact with the valuable information, then you should check out [this app].” — Christine Chan, AppAdvice “Best typography on the small screen yet […] Get this app, a brilliant Wikipedia reader.” — Erik Spiekermann, Typographer “[This app] is an exceptionally crafted app for experiencing Wikipedia on your iOS devices. […] the wonderful visualization sweeps you off your feet.” — Preshit Deorukhkar, Beautiful Pixels # Here’s why you’ll like this app: NEARBY PLACES: Discover interesting Wikipedia articles about the area around your location. Or explore any other spot in the world. It’s fun with our signature map visualization. MOST READ ARTICLES: See what other people read and find out what’s going on in the world. The “Most Read” section makes discovering hot topics a breeze. SEARCH RESULTS: Powered by both Wikipedia’s full-text and prefix search, you’ll find what you’re looking for. Matches are displayed as rich article previews, tweaked for both legibility and high information density. READING INTERFACE: We’re passionate about great typography! So it’s only natural that the layout is designed to make reading Wikipedia articles pleasant and efficient. 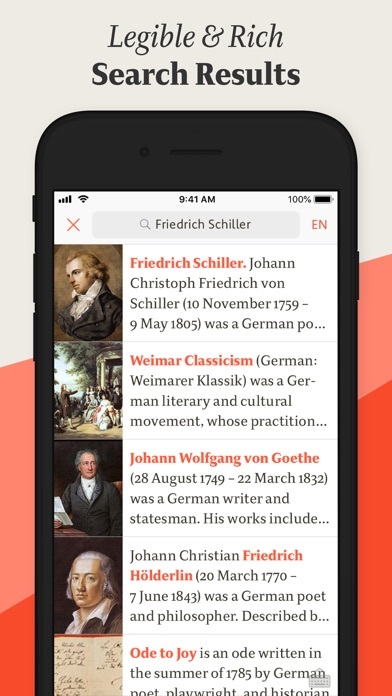 BOOKMARKS & HISTORY: Add bookmarks to the list of your favorite articles. Your searches and articles are kept in the History tab—automatically. IMAGE GALLERY: Browsing Wikipedia’s images just got more fun: The brand-new gallery lets you see all of an article’s images at a glance. # More Features SMART LAYOUT: A combination of advanced layout optimizations analyze and reformat every article for ideal readability and great looks. NATIVE iOS EXPERIENCE: For some Wikipedia Apps, iOS is just another platform but for us, it’s the beloved one and only platform! You’ll feel right at home. BEAUTIFUL TYPE: Carefully crafted typography and high-quality typefaces in twelve different styles create a world-class Wikipedia reading experience. MULTILINGUAL: Switch effortlessly between languages—if you read more than one. Or check out an article’s title in all available languages. We promise, it’s fun! DARK MODE: Switch to the dark theme for relaxed reading at night. Easy to toggle with the pinch-to-zoom gesture—right in the article view. # Even More Features – Efficient images load high-resolution versions right before you view them, saving time and bandwidth – Large tables are shrunk proportionally to fit on screen – Table of contents panel for quick navigation – Wikipedia editing in Safari — just tap the share icon – Search for text within the article you’re reading – Show and hide footnotes for references without scrolling – Slide Over and Split View support on iPad – Open articles from Safari’s share menu – Search from any other app via the text-selection context menu – Dynamic Type respects your device’s font size settings – VLC integration to play Wikipedia’s esoteric media file formats – Natural image zoom with swipe-to-dismiss – Syntax highlighting for source code examples in articles – Sophisticated sharing that you’ll actually want to use – Support for portrait and landscape orientations – Supports VoiceOver – Supports 3D Touch for previewing articles # Wikipedia On Your Apple Watch NEARBY PLACES: Quickly find articles about points of interest around you VOICE SEARCH: Easily find anything on Wikipedia using your voice HANDOFF: Swipe up on the lock screen to continue reading on your iPhone BOOKMARKING: To read later, just force-touch and transmit a bookmark to your iPhone UNCOMPLICATION: Launch the app right from your favorite clock face Whether you’re exploring the city with an Apple Watch or being productive on an iPad Pro—it looks and feels great. At any size. You knew you loved Wikipedia. You didn’t know it could feel this good on iOS. Great app. I especially enjoy the map feature. I do wish there were more customizable settings for font. At minimum, a toggle to switch between serif and sans-serif for the main text would be so greatly appreciated, as it would make things easier to read for those who prefer sans-serif. “V” presents Wikipedia articles in a much more visually pleasing manner than a web browser does, making the articles readable and joyful to explore. I particularly like the tasteful choice of fonts, that all sections of an article are expanded by default (unlike in a browser view), and that the table of contents is easily accessible at the bottom of the screen. 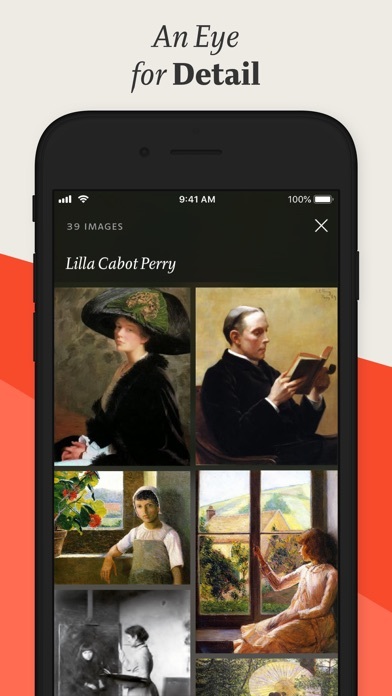 Illustrations are integrated into the text flow at a well-suited preview size, a single tap opens them to fullscreen (with caption included), and likewise closes that view. “V” is my preferred means for lookups and browsing. I often launch it via its system-wide sharing integration from web views. The essential way to read Wikipedia. Must have. I use it daily. 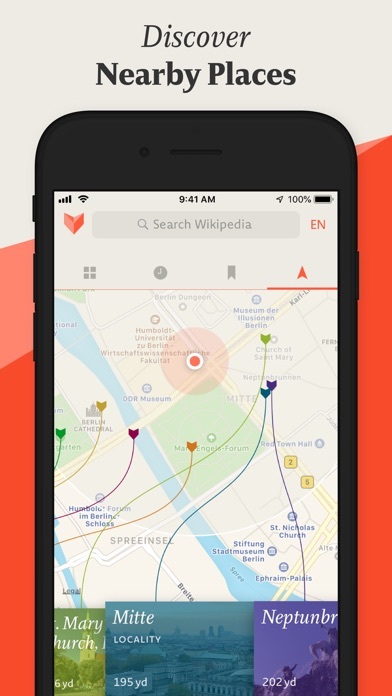 This app makes Wikipedia far more enjoyable to read and explore. The index popout is very helpful. Adding the gallery feature is a nice touch for some articles. Browsing history is sometimes useful for items I want to revisit. I don’t especially need the ability to reduce the font size: I like it just as it is. I’m glad I donate to Wikipedia yearly: you should too. This app makes it all the more worthwhile. Best way to browse Wikipedia with the new font options. The dev listened to my feedback and incorporated a new feature. Great app. Would be even better if there was an option to search right after launching (to avoid the extra tap in the search box). Fantastic app — Most used of all! Gorgeous and efficient version of Wikipedia that I use multiple times a day. Especially useful is the ability to see, instantly, a map of wherever you are in the world with pertinent entries of local physical attractions and historical events. You can also pan the map and get entries from other locations besides the one you inhabit. Just outstanding esthetics and a real joy to use. Most highly recommended! I bought this and have been always a little disappointed. The UI on the "most read" page starts the app off really well.. However, when it comes to the UI of everything else, especially on Dark Mode, is pretty ugly. Brownish-red dark theme, NO sans-serif font, and literally zero customization options outside of light/brown(ugly) modes. It's like the creator made the startup page, then half-assed the rest. Can't even sign into Wikipedia from last I saw, and overall lacking in features in general? I'm genuinely surprised that this app was "best of 2016" (by whose standards? Nobody knows). I'm just going to use the official Wikipedia app, thank you. NEXT.